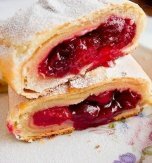 Bake a delicious pie with sweet cherries which give it special juiciness. The soft, moderately sweet pie with a slightly sour berry taste will melt in your mouth. 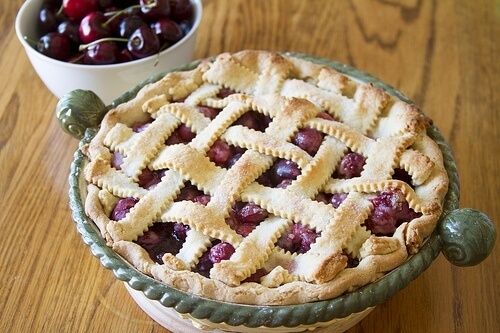 Just try this sweet cherry pie with lattice crust and see for yourself. Froth yolks and sugar. Add ground rusks, flour, cinnamon and whipped whites of the egg. Mix the ingredients and knead the dough. On floured surface, divide the dough into two parts and roll out pastry into two circles. Grease a baking cup with dairy butter and transfer one crust there. Wash sweet cherries, remove the stones and combine the berries with sugar in a separate bowl. Place the mass above the dough and spread it evenly. Take the other half of the pastry and cut it into stripes with 1,5 – 2 cm breadth. 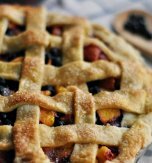 Place the stripes horizontally and vertically across the top of the pie in order to form a lattice. Preheat the oven to 220°C (428°F). Cut off the hanging stripes and crimp edges to seal. Top the pie with sugar and grease it with yolk. Cover the cake with foil and place it in an oven. Bake the dessert for 35-45 minutes until golden brown color. It is advisable to remove the foil in 15 minutes before the end of baking. Cool the pie and set it aside for 2 hours. 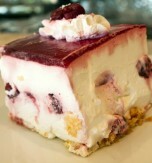 In that case you will be able to enjoy the palate fullness of the sweet cherries. Then cut the dessert into wedges and serve with cold fruit juice. 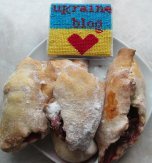 Do you have a favorite Ukrainian recipe for a lattice cherry pie? If so, please let us know in the comments below or write us an e-mail.